Looking forward to a beautifully flowing Water Season at Inanitah with Paul Ometepe. 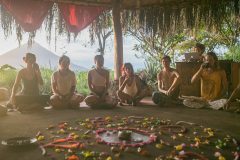 Come join us at Inanitah on Ometepe Island in Nicaragua to learn, explore, heal, co-create and connect in a loving community surrounded by the beautiful nature of this tropical Paradise. There will be lots of Yoga and Acroyoga, Biodynamic Breathwork (www.biodynamicbreath.com), Connecting with Nature, Meditation, Authentic Relating, Learning about Natural Building and Permaculture, Shamanic Healing, Cacao Ceremony and Celebration, Ecstatic Dance, aerial silks, slackline, a beautiful spring fed pool and hottub and of course, delicious and fresh communal meals prepared from our gardens and the surrounding community.